Every day you spend hours sitting in front of computer in the office. Sitting for a long time can cause shoulder and back problems like lower back pain, stiff neck. That's the reason why offices are equipped with comfortable and ergonomic office chairs. 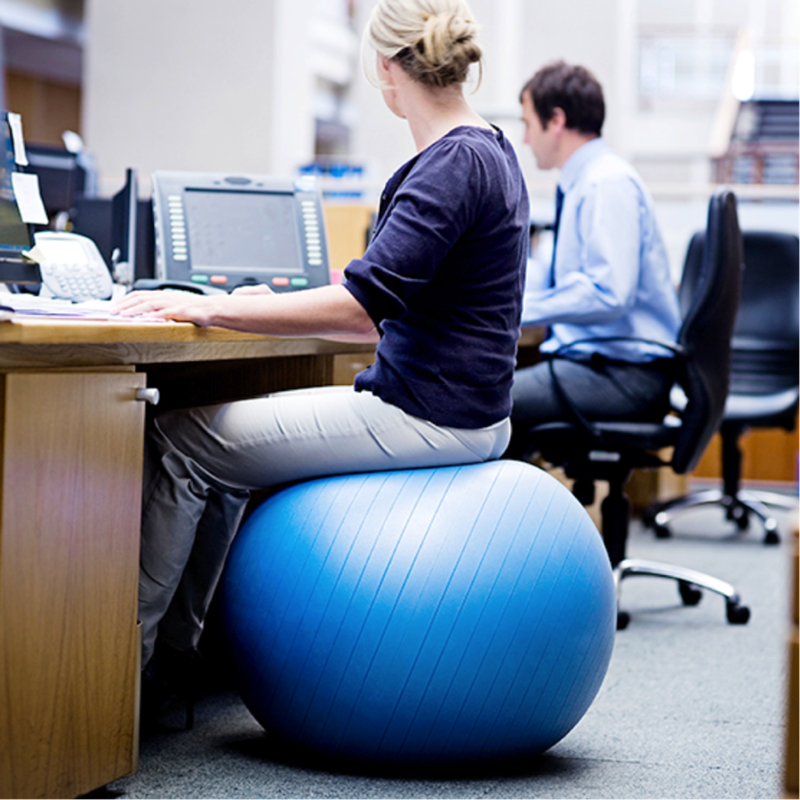 However in some offices now, instead of ordering office chairs, people are tending to buy an exercise ball (also known as the stability or Swiss ball). Is an exercise ball really well for your health and should you use the ball all the time instead of an office chair? Let’s find the answer together by considering its pros and cons. As opposed to the traditional chair, the exercise ball has an effect on core strength. It improves the strength as abdominal muscles are constantly engaged to prevent toppling over. Increasing core strength results in improvement in balance, posture and stability. 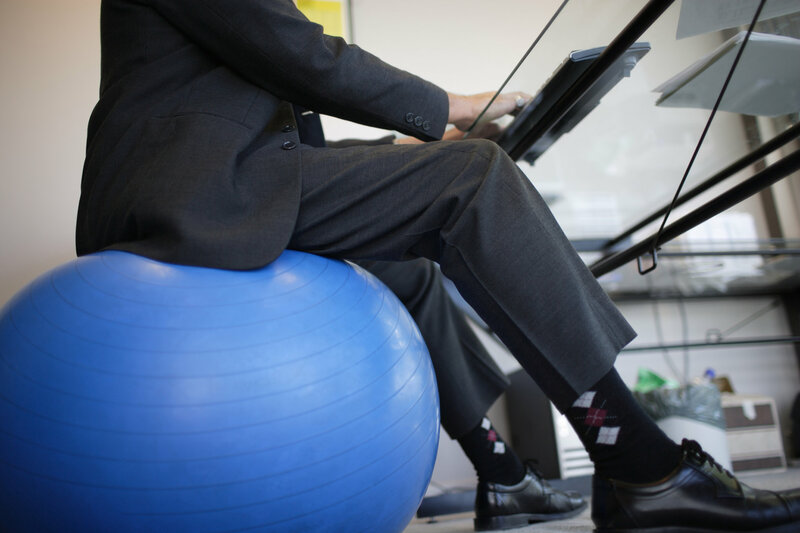 During working hours, you have some few minutes to take a break, when using the ball; you can use your “chair” to perform some fitness exercises. However, remember to do that only when you have learnt or practiced exercises associated with ball well. This is because an incorrect technique used in performing these exercises can cause you injuries. Just as there are two sides of a coin, the exercise ball also has multiple disadvantages. Check these and decide whether you can use it or not. It may be too low or too high thus it can make you feel uncomfortable. But you can solve this problem by rearranging your entire workstation. Using the right size of the ball when it’s slightly deflated renders the ball an ineffective piece of equipment. Feeling tired and need to lean back a bit? Well, the ball unfortunately doesn’t allow for this. The lack of arm rests and back supports clearly means that the stability ball is less effective. According to the UCLA Comprehensive Spine Centre, the armrest is vital as it takes some strain off both the neck and the shoulders thus preventing slouching. And in warm weather, it can get sticky and sweaty. Some publications dating back to 2006 (Clinical Biomechanics, Department of Kinesiology, University of Waterloo, Ont., Canada.) show that there are no significant differences in terms of muscle activation between the office chair and the stability ball. In fact, resting muscle activation is a major contributor of fluid loss from the invertebral discs resulting in lumbar stiffness. While sitting on a stability ball, the contact surface is more compared to an office chair increasing discomfort as well as muscle fatigue. Wobbling all over is very common especially if using the ball is a novelty. The traditional chair offers an even distribution of your weight away from both the load and softer tissues under the sitting bones. Enhanced spinal shrinkage is associated with the stability ball. In as much as more trunk motion is offered, it is at the expense of the lumbar and spine loading. The adverse effect of increased stiffness is a major factor contributing to lower back pain. Use it for a maximum of 25 minutes and alternate between it and the office chair. Purchase a quality exercise ball that has incorporated the anti-burst technology. While sitting on it, keep the feet flat on the ground and pull the tummy button in to keep the ball stable. Look for the right size of ball that is proportional to the desk height to prevent slouching.